looking down at the Mer de Glace. For those who want to see glacial recession first hand, go and visit the Mer de Glace in Chamonix, France. In 1909, the Montenvers train was built to take sightseers and adventurers up to the Mer de Glace, which when it opened, was at the level of the train. To reach the glacier from the train now, one needs to take a tram down approximately 200m, and then a staircase another 400 steps down, and counting. 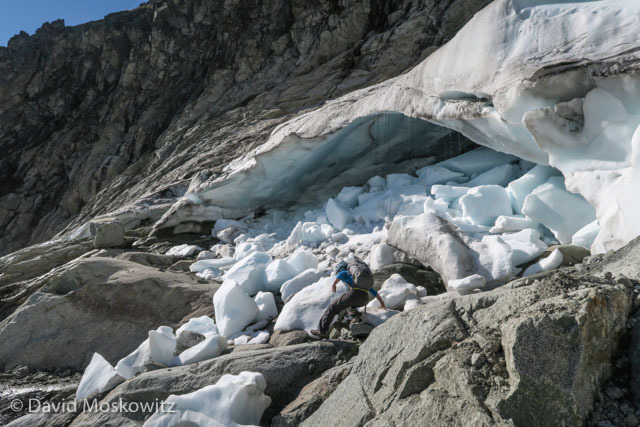 I have been visiting Chamonix for the last 15 years, and I have seen a dramatic drop in the ice. We often climb over the staircase after skiing from the Aiguille du Midi, making it easy to observe the changes year to year, as the place we enter keeps lowering. I spent the first half of last summer in Chamonix. Most everyone was staying off of north faces because the freezing level stayed above the summit of Mont Blanc for over two weeks. Massive boulders once frozen into place were falling through hiking trails, entire peaks were felt settling, and the town “closed” Mont Blanc due to the amount of rock fall coming down. Coming home to the northwest, I knew I had some surprises in store with the state of the mountains there as well. There had been an unusual lack of winter in 2015, followed by a hot and dry spring and summer. 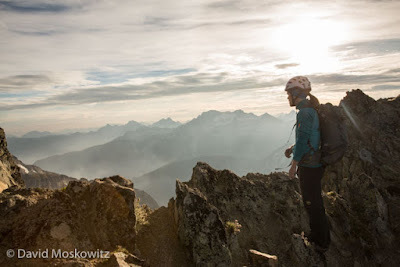 My first trip out was guiding the north ridge of Kulshan in early August. Approaching camp, we hiked out of the trees and saw the slope above to gain the Coleman Glacier. This slope, which is usually smooth summer snow with maybe a few cracks late season, was completely dry ice, the grays and blues cresting out of sight. I could barely believe the view. The fern line was at least 1000’ higher than I’d ever seen it in early August. After barely making it to the north ridge through the maze of crevasses, we had great, but firm conditions for the entire ridge. Coming down from the summit in the whiteout that had rolled in an hour before, I pulled out my GPS to confirm I was on the Roman Wall. 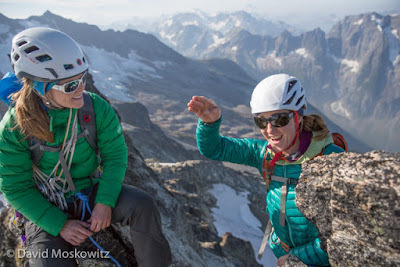 After having guided Mount Baker numerous times over the last six years, I know that route very well, and yet it felt like brand new terrain last summer. A large rock band extended the upper quarter of the wall where in the past had been just snow, and I had to double check where I was. On the East ridge of Forbidden Peak, Erin looking out at the hazy Cascades. About a week later, a Facebook post informed me that it was possible to climb the west ridge of Forbidden Peak without touching snow. My friends and I hatched a plan to traverse Forbidden in a day with light packs. We left the parking lot with only approach shoes and no crampons. In the back of my head, I still couldn't believe I was heading for this classic “snow and rock” route without any snow equipment. When the sun rose in Boston Basin and we got our first look at the state of affairs, we were all speechless. Whether you want to call it the nameless glacier underneath Forbidden Peak or the nameless permanent snowfield, one thing was clear, there was no longer anything permanent about it. The basin, which is normally filled with a pocket glacier to reach the peak above, was a broken mess of blocks that were no longer connected. Truck sized pieces of ice stood alone on the smooth granite slab, and littered small chunks of ice were scattered around from the previous days shedding. We scrambled quickly around the ice chunks on the rock slab and made our way up towards the east ridge by climbing through loose rock that was seeing the light of day for the first time in many years. We climbed up the east ridge, and sat on the summit looking into Boston Basin. Looking down, even with endorphins rushing from a great day out with friends, my heart ached through the smoky skies while regarding the diminishing permanent snow field below as the canary of the Cascades. Its worth mentioning that this is not the first time this permanent snow field has looked like this. Throughout the last handful of decades, climbers have observed conditions similar to this. I'm curious though if this will begin to be the new "normal." Many mountain routes are going to change dramatically over the next decade and beyond. While it is a unique and interesting way for humans to watch the earth change during a timeline we can comprehend, it is scary for what it foretells about our planet; and for those of us with Champagne problems, the new mountain hazards it is creating. Loose rock, settling rock formations above melting permafrost, massive ice movement, and potentially more unpredictable catastrophic events. Be careful out there, even on routes that you know well because things are changing at an unprecedented rate.